The Bible has become a hot topic in the media after the smash-hit mini-series that aired on the History Channel. It seems the topics of faith and the Bible are often on the lips of every commentator on television. I happened to watch Bill O’Reilly last weekend as he interviewed Mark Burnett and Roma Downey, the creators of The Bible: The Epic Miniseries . I don’t typically watch O’Reilly, but I have heard him identify as a Christian, and I know he is open about his Catholic faith. That’s why I was saddened to hear him say he was taught at his Catholic school that some of the Bible is to be taken literally, but other parts of it are simply allegorical. As Christians, the Bible is the one thing that should not be negotiable. It is the foundation of our beliefs, the cornerstone of our faith. Mr. O’Reilly used the story of Jonah as an example, implying it is an allegory because it is unbelievable. Yet, as a Catholic, he has no problem accepting the virgin birth as fact. 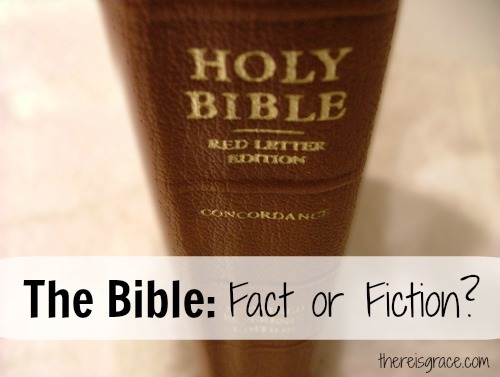 If we start down that road, how do we determine what parts of the Bible are fact and what parts are fiction? How do we decide what we will believe in the Bible and what we won’t believe? Is it based on one’s opinion of what is “believable?” Could not a God who is big enough to orchestrate the virgin birth of a Messiah manage to keep His prophet safe in the belly of a fish? Since when has God or His Word been limited by our belief (or lack thereof)? It saddens me that it was “spiritual leaders” who taught Mr. O’Reilly to doubt the authenticity of Scripture. Those who should have taught him to view God’s Word as the authoritative standard, taught him instead to make it subjective to his own limited beliefs and opinions. I do not look to Bill O’Reilly for spiritual guidance, but there are those whose spiritual beliefs are highly influenced by the media. As a very vocal public figure, Mr. O’Reilly is no doubt shaping how they view the Bible. As Christians we must teach our children that the Bible is more than a good idea. It’s more than a compilation of great, moral stories. It is God’s Word. It is true…every word of it. So, how do we do that? 1. Read it. Let your kids see you reading the Bible. Read it with them. Read it to them. 2. Talk about it. Discuss what you read. If you come across a passage you don’t understand, or your children ask a question you don’t know the answer to, dig a little deeper. Don’t be afraid of it; don’t shy away from it. 3. Internalize it. Choose a passage to memorize together as a family. 4. Live it. Don’t simply be a “reader,” be a “doer.” God’s Word is not meant to simply be read; it’s meant to be lived. I love this simple, 3-minute video about the two views of the Bible . It’s really quite simple: we either make the Bible an authority over us or we put ourselves in authority over it. How do you view the Bible? Do you see it as a word about God? Or is it the Word of God? Great thoughts, Nancy. I think we also need to make sure our LIVES show that we believe God’s Word – not just our lips. We say it’s true, but do we act like it? That speaks so much more to the world than mere words. Thanks for linking up at CMB today – glad I found you there! Have a blessed weekend! Good point Elizabeth. Might need to do a folllow-up post! Thanks for stopping by! Critical thinking skills are key elements to teach our kids as well. How and why the Bible is true must be teachings that come from us. Yes, and amen, Debi! Thanks so much for stopping by and for leaving such a great comment! Thanks Rose. And thanks for stopping by! Well-written article. And I agree so much. If we can’t rely on the accuracy and relevancy of the Bible, we are miserable creatures making up our own truth. And great tips for applying the Bible to our lives. Thank you for the kind words, Gail. And thank you for stopping by! Thanks for stopping by Stephanie! I can’t wait to come read your post! Great post and video by Mark Driscoll. “We either make the Bible an authority over us or we put ourselves in authority over it…” love this quote, so true. It’s so easy to put ourselves in authority when we read something we don’t understand or like, but we should always remember God’s Word is in authority over us and we need to humble ourselves and search the Scriptures for His guidance. Amen Cathy!! Thanks for stopping by! Just found your blog from Cozy Book Hop at the Reading List and I want to thank you for writing a great article. I agree with what Mark Driscoll says and I shared it on Facebook. And I am going to put your button on my blog. Thank you for your kind words and for sharing my button! I’m so glad you stopped by! Thanks for your thoughts Nancy. And thanks for linking God’s Word to Sunday Stillness. This is also a good post for Wednesday’s Word which will be tomorrow. I was just thinking that if people start to pick and choose what parts of the Bible to believe, they might not have had an encounter with the Living Word, our Lord Jesus. Their minds might still be veiled like Paul tells us in Romans. I realized that of the first Christians, approximately 80 % were illiterate, but they had the Living Word living in their hearts and they KNEW Him personally! Thanks for a thoughtful read and your visit to my blog.